What Makes Our Systems Different From Other Manufacturers? We are able to undertake these systems by our selection of our in house designed electronic circuit boards with data communication bus between them. This cuts out the requirement to have one main control panel at each room or set of rooms, reducing cost considerably. 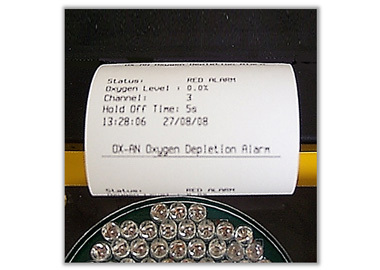 Our systems meet BSRIA Section W55 oxygen depletion monitoring specification, quite simply BSRIA Bracknell chose our system as there was not a definitive standard for this growing application. The key features of all our systems are the ease of use and understanding the systems. 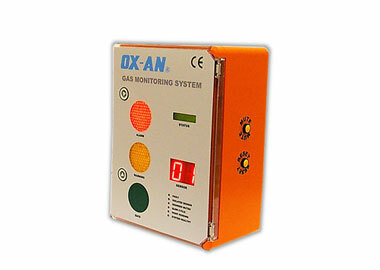 The traffic light system, which we believe is unique to our control panel, gives very clear indication to building occupants the status of the gas levels in the room(s) it is designed to protect personnel. When all is safe the Green set of LED’s are illuminated, this can be observed as a risk assessment every time one is entering the area. Should gas levels, whether oxygen depletion or perhaps carbon dioxide enrichment reach the first non latching amber warning level, the set of Amber LED’s will illuminate whilst the sensors are monitoring this condition. If the levels drop below the pre-set warning level the lights will go off and no further action is required. 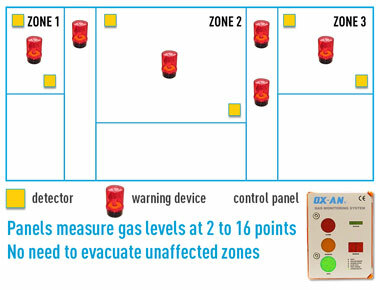 On the occasion when the gas levels reach the main red warning pre-set alarm level, the Red LED’s will illuminate and the system will activate the room warning devices. The warning devices have an integral sounder and this can be muted from the main panel, an external reset button allows the user to reset the system, if the system cannot be reset the client should have procedures in place to deal with this. Our system can connect to Building Management Systems to control ventilation or a direct connection can be made to the ventilation control system. We have many applications in LN2 stores and activates the ventilation is essential in clearing oxygen depletion. If you are an engineer, architect or specifier we can forward the relevant section in MS Word format for embedding in your project tender file.